So, it's been quite a busy weekend. On Thursday night I went to Wolves for the first time (not quite sure what the fuss is about, I had a completely different expectation of the place after having heard about it from so many people) with J9-double0blonde, @saulkza and @Nadgia. Always nice to try somewhere / something new tho. They had some live music which wasn't very impressive - we were sitting outside and I was barely aware there was even anything going on and it didn't seem like the sound quality was that great but anyhoo. But I definitely hate the after effects of too much alcohol these days. I hardly drink much at all anymore and I definitely despise that anxious feeling the next wondering if I did or said anything wrong or offensive to someone. And I replay the whole thing in my head over and over. Paranoid, much? Saturday was fairly lazy, but I did finish shopping for Daddio's xmas pressie. Now I only have one outstanding item left to buy :) I can not believe how organised I've been this year. But I definitely think the strategy of finding one thing a weekend is working for me - hahaha. On Saturday evening I went to Piccolino's in Fourways with @samanthaperry and @SynStalker - another new spot for me :) And let me just say that even tho I had to pay extra for both Avo and Feta (I mean really ?!? ), the pizza was *delish* !! The venue is a bit weird tho, but I imagine as an afternoon spot it works far better :) I'd go back. 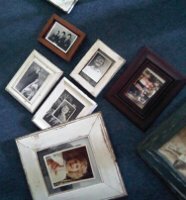 On Sunday I decided to haul out all the photo frames I've been collecting for my one-day wall. I know, it's very silly, but I can't seem to accept that I actually live anywhere because I keep expecting to move and so don't properly unpack / set-up some things (my Moroccan light has never been unpacked). And the thing with my photo wall is that it's far easier for me to justify not hanging them because a) the collection is still growing so how would I know yet how to hang them and b) none of them have photos in them yet so why bother yet. So I decided it was time to find some photographs for the frames (especially with my impending Cape Town trip ... I need an idea of what I'm looking for when I'm down there too!) so the morning involved eating left-over pizza, reading my book and sorting thru old family photos inherited from Daddio's Dad. I found some awesome ones and then decided to head off to the Rosebank Rooftop market ... for more frames and potentially to finish my xmas shopping (just need one last thing for Mom). I didn't do any xmas shopping tho, but I did do plenty of shopping for me :) 5 new frames! And some new drinking glasses and a brand new spatula (all part of the "yay I live on my own again" celebration!). And then I headed off to @jarredcinman's for sundowners. A lovely weekend actually.